We’ve taken our bicycles so many times on Amtrak that it’s easy to forget how intimidating it can be. Most stations don’t offer a lot of help, so you are left to your own devices with prepping your bicycle for the bike box. With that in mind, I thought I’d make a little instructional video. Admittedly, not the most exciting, but hopefully it will take out some of the anxiety of bringing your bike on Amtrak. Unless your on the few Amtrak lines that allow unboxed roll-on of your bicycle, you WILL have to box your bike. Aside from the pure mechanics of prepping your bike, it is a good idea to call the station you plan to depart from and arrive at to make sure it is a manned baggage station. If it isn’t, you won’t be able to load or unload your bike! To box your bike for the train only requires two simple procedures: 1) remove your pedals 2) turn or remove your handlebars. These two modifications narrow your bike so it can be easily pushed into the bicycle box. It is a good idea to have an adjustable wrench (that you know opens wide enough to fit over the pedal flats), a multi-tool, a sharpie (to write your info on the box) and your own roll of packing tape. We’ve been to some stations where they had no tape so we had to make an emergency run to go get some. Now we just carry our own. While you’re calling, you should also ask to see if they have a supply of bicycle boxes at the station. We hope the video was helpful and will encourage you to take your bicycle on the train! Thanks for posting this helpful video. I’ve added a link to it in the bike-and-ride section of Tips for Bicycling Monterey County. Here in MoCo, the Salinas Amtrak station is a destination for many cyclist visitors to National Steinbeck Center and other points of interest. However, a pedal spanner is only good for pedals, or some other 15mm nut. Adjustable spanners, while highly undesirable, can perform multiple tasks. And if you’re onl carrying one spanner . . . . . . There are moments when shop purity is not desirable. Great video….. where do you get the box? I’m thinking the Amtrak boxes must be a bit bigger than a standard bike box. I like the ability to just roll it in, without removing the front wheel. With racks and generator hubs, that’s more work. Another tip, is keep the pedal threads lubed with a bit of grease. As someone working in a shop, I do dread having to remove stuck pedals. I’ve seen the wrenches and profanity fly when they are really stuck. Thanks for the posts, helps us all get through the winter blahs. 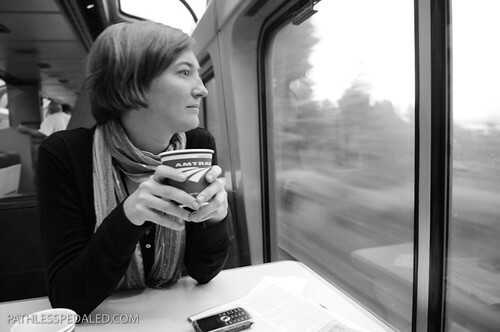 Last year I took Amtrak from Union Station in LA to Eugene, OR for a bike tour. They specifically asked me to NOT turn/remove my handlebars, though I did remove the peddles. Check at the station, I expect each one is slightly different. My brother and I are planning a trip in July to Bend to start a bike packing trip to Spokane. Starting our train portion in San Bernardino and picking up the Coast Starlight in LA. Any advice beyond what is in the video ? Be fairly flexible with your time schedule. Long distance trains tend to suffer from being late, so always allow for wiggle room on either end. Also call ahead to make sure the station has bike boxes! Bring your own packing tape. For the Boxing Bike for Train graduate course you can show how to prep a tandem bike for travel. Thanks for the video and encouragement! My understand is that for Tandem you cut an end off of each oof two Amtrak boxes and telescope them together. With a lot of tape and perhaps rope through holes that go through both sides. It is a good idea to have…your own roll of packing tape. We’ve been to some stations where they had no tape so we had to make an emergency run to go get some. Now we just carry our own. I’ve been there! Years ago I was departing Tucson, whose station was staffed by the most unfriendly and unhelpful person imaginable. When I asked for tape, he said he had none, but I could buy a roll from the Greyhound depot across the street. Classic! Another helpful tip: ask if there’s a used box available. New boxes are $15, so it’s a bit of a savings. Some stations save them, some don’t. Officially it’s Amtrak’s policy to not give out used boxes, which I think is stupid, especially for a company with an “environmental commitment.” I’ve been at stations where I see a stack of used boxes sitting there but the baggage clerk won’t give me one, because he or she is afraid they’ll get into trouble. If they don’t have one, scout around outside because sometimes people will leave them if they’re riding off. Also, if you are starting and ending from the same station, some clerks will be nice and let you save your box. Just make sure you write your name on it! Wish I had a pic. I brought my Brompton on Amtrak and put it in the overhead bin. It may not be for everybody, but if you’re going to travel, darn good bike choice. How do you like those pedals, I have been thinking about getting them for my commuter bike. I love cycling and I love Amtrak. Though I’ve yet to blend the two, your video is much appreciated. Thanks. Thanks for taking the fear factor out othe the equation. You made it look easy. happy trails. We recently rode our tandem from Northern California to the Santa Barbara Amtrak Station. We planned to box the bike by taping together two boxes from the station as suggested on the web page. I had called Amtrak to confirm that we could take a bike in a box on the Pacific Surfliner. No problem they said. However, the station said they would do no bikes in boxes–regardless of the size of the bike. They didn’t care that I had been given this erroneous information. Luckily, a friendly person took our bike home and we were able to go to San Diego on the train. Of course, now we have to get the bike back from the Santa Barbara person. I see now that in the last two weeks Amtrak has changed their policy and says they will take no tandems/recumbents period. Is anybody lobbying for tandems/recumbents? I’m on a train from NYC Penn station to Richmond VA. I discovered that the baggage policy changed today and the special item charge has been raised from $5 to $10. Each passenger can check up to 4 bags – 2 free of charge and 2 for $20 each. Each bag in checked baggage is limited to a size of 75 linear inches (length + width + height). Oversize baggage (76 – 100 linear inches) is accepted for $20.00/bag. Luggage must be checked 45 minutes prior to scheduled train departure. Rates for storage, parcel check will increase to $4.00 ($5.50 at New York Penn Station) per bag for each 24 hour period. Special item rates will increase from $5.00 to $10.00. Tandem bicycles and kayaks are no longer accepted. Each bag checked must be packed within a suitable container; plastic/rubber storage containers are prohibited. Last year was my first time traveling by Am track after finding out I could not box and travel by bus and air lines charging ridiculous prices to transport bikes l checked the train and couldn’t believe the simplicity and affordability. This year I’m taking that same trip with other bikers and I now look for bike events in towns that I can get by train the ride is an adventure in it self Thank you amtrak, The Only Thing That Would Be Nice Is If You Could Keep The Box At A Station That Does not offer Bike Boxes For The Way Back Instead Of Throwing It Away, It Could Be A Green Way To go.